The area offers the opportunity to spend a holiday of culture and entertainment in contact with nature. Into Medieval Villages: Fiorenzuola of Focara, Novilara, Candelara, Urbino and Montefeltro. castles and palaces: Gradara, San Leo, San Marino. Theme Parks: Overseas, Acquafan, Ships, Wonderland, Italy in miniature. Cycling Routes: many routes and paths for cyclists. City old and new, Rimini With monuments of a glorious past to a modern tourist organization. An ideal destination for holidays, for those who want to switch to the relaxation of a day at the beach, or the entertainment of a night at the disco, visiting art treasures handed down from the past. Rimini was founded by the Romans in 268 BC, as a colony of Roman law, a strategic hub and meeting point for trade. Towards the end of the thirteenth century. began the Malatesta in Rimini that became a hotbed of culture and art. This is, in outline, the story town well recorded by famous relics such as the Arch of Augustus , Tiberius Bridge and the Malatesta Temple. The city has two hearts alive and buttons: the old town, with its suburbs, and the sea, 15 kilometers of beach. 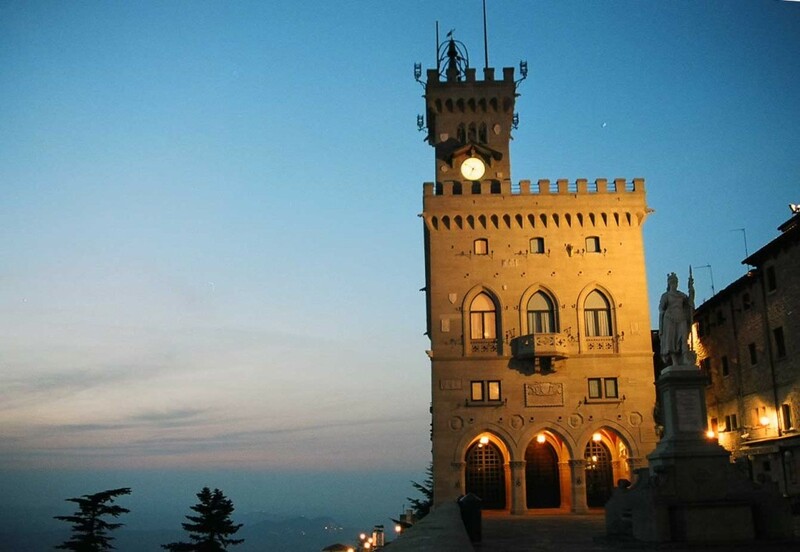 The Republic of San Marino, founded, according to tradition, in 301 AD now has 1700 years of history. Into The Republic is small, its territory is partly hilly, and generally poor, the people who inhabited it has always been short and not rich. E 'was organized with its own rules and its own unique institutions that regulate and supervise the conduct of democratic life in its aspects of city life and international participation. Into In this era of great change and great uncertainty what is most singular of a small country that manages to stay alive , still healthy and still free against the arrogance of the strong and violations of rights? Into a welter of old houses in a magnificent castle and un'occhiuta bell tower, a weaving of history and legend, the sacred and the profane, between horrid prisons and churches: this is S. Leo In times of wars between Goths and Byzantines, Lombards and Franks, San Leo saw his reputation grow as an impregnable fortress. Elevated to the status of capital of the Kingdom of Italy in 963 Berengar II refugee here. The tiny but strong city suffered for many months the siege of Otto I, Emperor of Germany. Verucchio has an old soul, or rather old, ennobled by the presence of a civilization in some ways still mysterious but certainly, judging from the evidence he has left, among the most beautiful in Italy. Into a pre-Etruscan population between the mid-eleventh century. and sixth centuries. B.C. was established here in thriving communities who saw the figures in the foreground of the "principles pastors." Population related to that of the great center of Villanova (town near Bologna), but for the richness and uniqueness of the findings, has led archaeologists to speak of a real Civilization Verucchiese. A magic village is to Santarcangelo , with his air of noble and mysterious, for its centuries-old history, its places thousands of years as the church, through the maze of passages which lie in its subsoil, for its being the capital of dialect poetry, for its living traditions, its events and its antique fairs, such as those of St. Michael (September) and St. Martin (November). Into worth seeing are the elegant churches, the beautiful square Ganganelli , the tiny alleys of the old town, the Malatesta Fortress, the caves, the Museum of the game of flask Bracelet and Tamburello and the Museum ethnographic Traditions and Customs of the People of Romagna, one of the most important collections of testimonies demo-ethno-anthropological Romagna.Verucchiese. Borgo di unmistakable medieval look happy in a panoramic position on a hill overlooking the Via Flaminia, Gradara is surrounded by a trapezoid-fourteenth century walls crowned with merlons and fitted with rectangular bastions. A curtain intermediate walls, towers and equipped with autonomous port, it carried a further protection to the fortress. Into The entire perimeter of the walls is path by a walkway on patrol continuously. In the western wall is reinforced by a massive polygonal bastion, the stronghold. Disclaimer Le Foto su questo sito sono tratte da scatti privati, ogni riproduzione non è consentita.